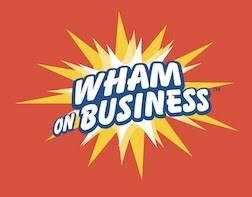 Wham on Business: Overled & Undermanaged??? Remember the old saw that “leaders do the right thing and that managers do things right?” Well according to Henry Mintzberg in Business Week, today’s businesses are overled and undermanaged. Strategies that end up being successful should not be conceived at the “top”. Rather they should grow throughout the organization via a kind of distributed leadership. Studies show that vital information is typically transmitted to a CEO informally, oftentimes orally, rather than in formal reports. Leaders who are removed from day to day managing aren’t going to get these messages. Management can be messy and requires an enormous amount of work by the leaders of business. If, you as President, don’t spend the appropriate amount of time managing, don’t count on your managers to spend the necessary time managing either. A prime example would be Ken Lay at Enron. While Ken was out hobnobbing with world leaders, his President, Jeff Skilling was driving the company into bankruptcy. According to James G. March, “Leadership involves plumbing as well as poetry”. So, remember, the best leaders are good plumbers as well.